HELL'S KITCHEN — A new bar in Hell's Kitchen is taking the laws of supply-and-demand to a whole new level. The New York Beer Company is selling the 40 different beers it has on tap on a fluctuating stock market — complete with a scrolling stock ticker and a backdrop reminiscent of the New York Stock Exchange. Prices at the bar, at 321 W. 44th St., will go up and down based on how popular a beer is — the fewer people drinking a certain kind of brew, the cheaper it is. If everyone wants a piece of an ale, the price of a pint shoots up. "We're all in the same business — selling beer and food," said Tony Doyle, New York Beer Company's co-owner. "This is what I think will set us apart. It's just another fun thing." Prices will fluctuate between roughly $4 and $8, Doyle said — and every once in a while, managers will trigger a 'market crash' that will plunge all of the beer to a daily low. "We're not going to do that too much," Doyle said sheepishly. Doyle is no stranger to the local bar scene. Along with his business partner and fellow Irishman Brian Connell, he runs the nearby House of Brews and Bourbon Street Bar. The 5,000 square foot, 300-person New York Beer Company, which Doyle hopes to open by early March, is going to have other New York themes besides the stock market. The bulk of the beers it'll serve will be from New York state. The bar has a massive full kitchen with a pizza oven that would look at home at your local slice joint. 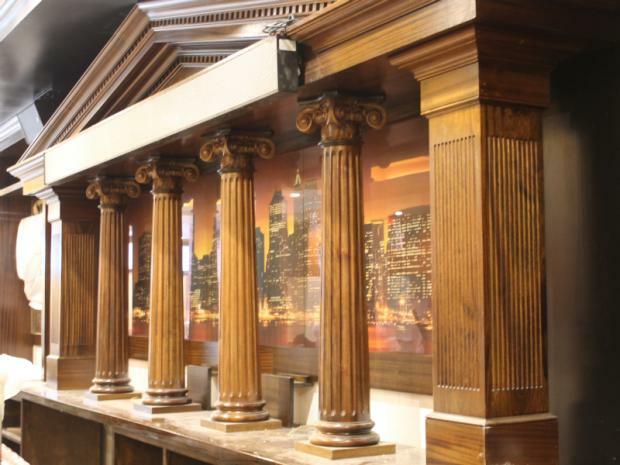 "We're going for a real New York theme," said Patrick Schmidt, the bar's manager. In case those aren't enough gimmicks for you, the bar will have two "draft tables" — where groups of customers can pour their own beers based on credits they buy from the bar's staff. Doyle said his large space will attract customers of all sorts — including tourists and locals looking for an after-work drink. "This area's exploding right now," he said. "We'll pull a lot of corporate business. It's going to be a mishmash of everyone." As for what beers will be in demand, Doyle said he's not sure, but expects to see a pale ale from the Bronx Brewery become a favorite. "That one's going to have a good stock," he said.